other military fast boats, Naval MTBs, MGBs and RAF HSLs. These were numbered C/T 1 - 49 (there were 2 CT 26's), in fact our own HSL 102 was converted to C/T 12 in 1943. On top of this Thornycroft built a number of boats between 1938 - 1944 numbered DCMB 01, DCTB 1 - 6 and Queen Swan 5 - 10 (DCTB 1,3,5 & 6 became Queen Swan 1 - 4. The War Department Army also had 131 12ft Queen Gull remote control target boats built by the British Power Boats Company at Marchwood Park. We have Queen Gull 78 in our collection at Marchwood. Post War, a number of British Power Boat 71ft MTBs were converted to Radio Control Boats and numbered RCB(EL)1 - 5, also known as 8201 - 8205. (note 8202 had been C/T 46 since 1945). Also two 73ft Vosper MTBs (C/T 44 & 45 since 1945) were renumbered CT 8044 & 8045. Note that the RAF also converted four of their 68ft HSLs to Target Launch Remote Control 1n 1949/50. These were 2631, 2678, 2688 & 2690. 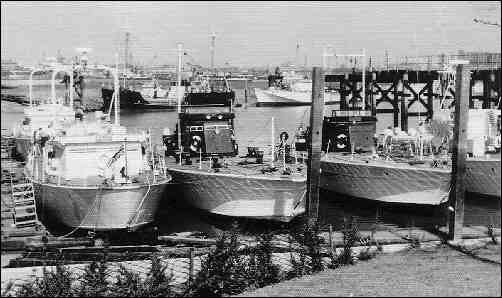 But these were reconverted to Rescue and Target Towing Launches (RTTL) in 1951. Newbuilds were CT 8101 - 8104 (ex 101 - 104) 77ft boats built by J S White 1947/48. No other boats were converted or built until 1961/62 when J S White built HST 903 a 56ft target and HST 1104 a 50ft target. Besides survivors mentioned above, no other known survivors exist. C/T 31 built by the Canadian Power Boat Co as TM 28 for the Dutch Navy was a hulk at Conyer Creek in Kent but was demolished between 1998 & 2000. One of your type CT8101 - 8104 became the Motor Yacht "Gay Mariner" and was a charter yacht in Majorca in the 70's and early 80's, sadly no recent details.